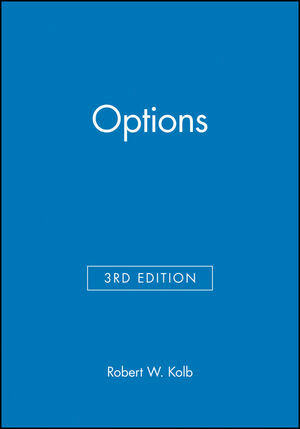 The third edition of Options is a comprehensive look at the most simple to the more complex use and structure of options. ROBERT W. KOLB was John S. and James L. Knight Professor of Finance at the University of Miami until 1995. He is author or coauthor of finance texts on a range of topics including futures, options, financial derivatives, investments, corporate finance, and financial institutions. He was founder and president of Kolb Publishing Company, sold to Blackwell Publishers in 1995. His research has been published in Financial Management, the Journal of Finance, the Journal of Risk and Insurance, the Journal of Financial Economics, and the Journal of Futures Markets. Part I: The Options Market:. 2. What Is an Option?. 5. American and European Options. 14. The Organization of the Text. Part II: Option Payoffs and Option Strategies:. 5. European and American Option Values at Expiration. 6. Buy or Sell a Call Option. 7. Call Options at Expiration and Arbitrage. 8. Buy or Sell a Put Option. 11. Combining Options with Bonds and Stocks. Part III: Bounds on Option Prices:. 2. The Boundary Space for Call and Put Options. 3. Relationships Between Call Prices. 4. Relationships Between Put Option Prices. 5. Option Prices and the Interest Rate. 6. Option Prices and Stock Price Movements. 7. Option Prices and the Riskiness of Stocks. Part IV: European Option Pricing:. 2. The Single-Period Binomial Model. 3. The Multi-Period Binomial Model. 4. Binomial Put Option Pricing. 6. The Binomial Approach to the Black-Scholes Model. 7. The Black-Scholes Option Pricing Model. 8. Inputs for the Black-Scholes Model. 9. European Options and Dividends. 10. Tests of the Option Pricing Model. Part V: Option Sensitivities and Option Hedging:. 2. Option Sensitivities in the Merton and Black-Scholes Models. 10. Option Sensitivities and Option Trading Strategies. Part VI: American Option Pricing:. 2. American versus European Options. 3. Pseudo-American Call Option Pricing. 4. Exact American Call Option Pricing. 5. Analytical Approximations of American Option Prices. 6. The Binomial Model and American Option Prices. Part VII: Options on Stock Indexes, Foreign Currency, and Futures:. Part VIII: The Options Approach to Corporate Securities:. 2. Equity and a Pure Discount Bond. 3. Senior and Subordinated Debt. 2. Assumptions of the Analysis and the Pricing Environment. 15. OPTION!Installation and Quick Start. * Concise treatment of simple to complex options. * Presented in a non-mathematical format. * New chapter on exotic options. * Two chapters on European options.